The aim of this study was to evaluate the effects of adding dexmedetomidine or fentanyl to bupivacaine in ultrasound-guided infraclavicular block (ICB) for upper limb surgeries. These effects include quality and duration of the analgesia and analgesic consumption. ICB provides anesthesia and analgesia to the upper limb. Many adjuvants have been used to improve the quality and duration of analgesia in various nerve blocks. A total of 120 adult patients undergoing elective forearm or hand surgeries received ICB with 27 ml of local anesthetic mixture, and were randomly allocated according to the local anesthetic mixture into three groups – group C (control group) (bupivacaine), group D (dexmedetomidine) (bupivacaine+dexmedetomidine), and group F (fentanyl) (bupivacaine+fentanyl). The three groups were compared for the time of onset of sensory and motor blocks, postoperative analgesia, hemodynamic changes, and complications. The onset of sensory and motor blockade was significantly more rapid in group D than in groups C and F. The duration of sensory and motor blockade was significantly longer in group D than in the groups C and F. The duration of analgesia was significantly longer in group D than in groups C and F. Heart rate levels were also low in D group compared with groups C and F during the period of anesthesia. We conclude that the addition of dexmedetomidine to a local anesthetic mixture in ultrasound-guided infraclavicular brachial plexus block hastens the onset and prolongs the duration of sensory and motor blocks, as well as the duration of postoperative analgesia, compared with the addition of fentanyl or bupivacaine administration alone. Infraclavicular brachial plexus blockade (ICB) provides anesthesia for surgeries of the hand, forearm, elbow, and distal humerus. An ICB has the advantage of minimal risk compared with intravertebral, intrathecal, or epidural injection, as well as reduced incidence of phrenic nerve paralysis or stellate ganglion block . ICB has a small risk of pneumothorax, hematoma, and nerve injury ,. Ultrasound (US) allows the ICB to be performed safely. The use of US provides good visualization of the needle position, the local anesthetic spread around the cords ,, increases the success rate, and minimizes complications, especially in patients with anatomical variations . Many additives to local anesthetics have been used to decrease the dose and side-effects and to improve the quality of the block [5–7]. Fentanyl is a μ-opioid receptor agonist that has been used as an adjuvant to local anesthetics, improving the efficacy of peripheral nerve block ,. Dexmedetomidine is a selective α2-adrenoceptor agonist, which has been used as an adjuvant to local anesthetics during regional and local anesthesia. Some studies have shown the safety and efficacy of adding dexmedetomidine to local anesthetics ,. The aim of this study was to compare ICB characters and analgesic effects caused by using bupivacaine 0.5% alone or with dexmedetomidine or fentanyl in patients undergoing elective upper limb surgery. The secondary aim was to evaluate the hemodynamic and adverse effects caused by the addition of dexmedetomidine or fentanyl for US-guided double-injection ICB. The present study was a hospital-based, randomized controlled trial, which was carried out on 120 patients after obtaining a written informed consent from all of them. The study was approved by the research ethics committee of the Faculty of Medicine, Menoufia University. Our sample included American Society of Anesthiologist I or II patients in the age group of 18–60 years undergoing elective forearm or hand surgery from January 2014 till March 2016. Exclusion criteria were patient refusal, uncooperative patients, patients with peripheral neuropathy, coagulopathy, history of brachial plexus injury, and allergy to any of the drugs that were used in the study. Group F: 25 ml bupivacaine 0.5%+100 μg fentanyl in 2 ml. Patients were instructed preoperatively regarding the steps of the technique, position of the arm and head, and use of the visual analog scale (VAS) for pain assessment. Patients were reassured about the technique and use of US and its advantages. Standard theater monitors including ECG, noninvasive arterial pressure, and pulse oximetry were attached to all patients before the technique. An intravenous (IV) cannula was inserted into the contralateral arm. Patients were given 2–5 mg of midazolam IV as premedication 10–15 min before the procedure. Patients were positioned supine with the face rotated to the contralateral side to facilitate the block. The skin at the site of the procedure was disinfected using chlorhexidine 0.12%. In patients who were allergic to chlorhexidine, povidone–iodine 10% was used for disinfection. The skin at the site of needle entry was infiltrated with 5 ml lidocaine 2%. The block was performed under US guidance using a Sonoscape A5 ultrasound machine (SonoScape Medical Corp., China). A linear probe was used. A depth of 3–4 cm and a frequency of 10–12 Hz were chosen. A 50 mm, 20 G nerve-stimulator needle (Braun) was inserted in-plane with the linear ultrasonic probe. The arm was abducted to 90° with flexion of the elbow to bring the artery and plexus closer to the skin. The coracoid process was identified by palpating the bony prominence just medial to the shoulder while the arm was elevated and lowered. Scanning was performed just medial to the coracoid process and inferior to the clavicle with the transducer in the parasagittal plane to identify the axillary artery by its thick wall and brisk pulsations. The pectoralis major and minor muscles were identified just above the brachial vessels and plexus. The hyperechoic cords of the brachial plexus were identified with their corresponding positions relative to the artery. The needle was inserted in-plane from the cephalad aspect, with the insertion point just inferior to the clavicle. The local anesthetic mixture (17 ml) was injected posterior to the artery. The needle was withdrawn to the lateral aspect of the axillary artery, and 10 ml of the mixture was injected. Intraoperative sedation was started with propofol infusion IV (25–75 μg/kg/min) (1.5–4.5 mg/kg/h). The intraoperative and postoperative assessments were carried out by an anesthesiologist who was unaware of the drug used. Evaluation of sensory and motor blocks was performed every 5 min in the musculocutaneous, median, radial, and ulnar nerve territories over a 30-min period beginning when the needle was withdrawn from the patient. Sensory block was evaluated by comparing the degree of cold sensation in response to ice in the central sensory region of each nerve with the same stimulus delivered to the contralateral side. 0 = no difference from the unblocked extremity. 1 = less cold than the unblocked extremity. 2 = no sensation of cold. Motor block was evaluated using the forearm flexion, thumb abduction, thumb and second digit pinch, and finger abduction for the musculocuatneous, radial, median, and ulnar nerves, respectively. 0 = no loss of force. 1 = reduced force compared with the unblocked extremity. 2 = incapacity to overcome gravity. Surgical anesthesia was defined as surgery without patient discomfort or the need for supplementation of the block. If a part of the surgical territory was not completely anesthetized, at the time of surgery general anesthesia was used, and the patient was excluded from the study. The duration of the sensory and motor block was assessed. The first postoperative call for analgesics was recorded. At that time, the VAS (0–10) was assessed, and the patient was given 50 mg pethidine IV. From then on, VAS was assessed every 2 h for five readings. If at any time the VAS was equal to or more than 3, the patient received 30 mg adolor, and if the VAS was 5 or more 25 mg pethidine was given IV. The total dose of adolor and pethidine administered in the postoperative period was recorded. Sedation score [the Ramsay Sedation Scale (RSS)] was used to assess sedation. The RSS scores sedation at six different levels, according to how rousable the patient is. Vital signs including heart rate, oxygen saturation, and mean arterial blood pressure were recorded before the block at baseline and at 15, 30, 60, and 90 min after the block. The patient's satisfaction with the anesthetic technique was assessed after the patient's arrival at the postanesthesia care unit. The surgeon's satisfaction with the ICB was assessed at the end of surgery. Complications such as blood vessel puncture, intravascular injection, drug overdose, hypotension (mean arterial blood pressure decrease by 20% or more from the baseline), bradycardia (heart rate lower than 50), or dyspnea were recorded. A power analysis was performed to determine the necessary number of patients for each group, and it was estimated that 40 patients would be needed in each group to detect differences with a study power at 0.827. Data were collected, tabulated, and statistically analyzed using MedCalc Statistical Software version 15.8 (2015; MedCalc Software bvba, Ostend, Belgium). Normality of numerical data distribution was tested using the Kolmogorov–Smirnov test. Continuous variables are expressed as mean ± SD or medians with interquartile ranges as appropriate. The χ2-test was used to compare nominal data, the Kruskal–Wallis test with post-hoc analysis was used to compare numerical data between groups, and a paired t-test was used to compare measures within the same group. All analyses were two-tailed, and P less than 0.05 was considered to be statistically significant. A total of 10 patients were excluded from the present study because of failed block (after supplementation with local anesthetics). Patients' demographic and operative data were comparable between groups [Table 1]. 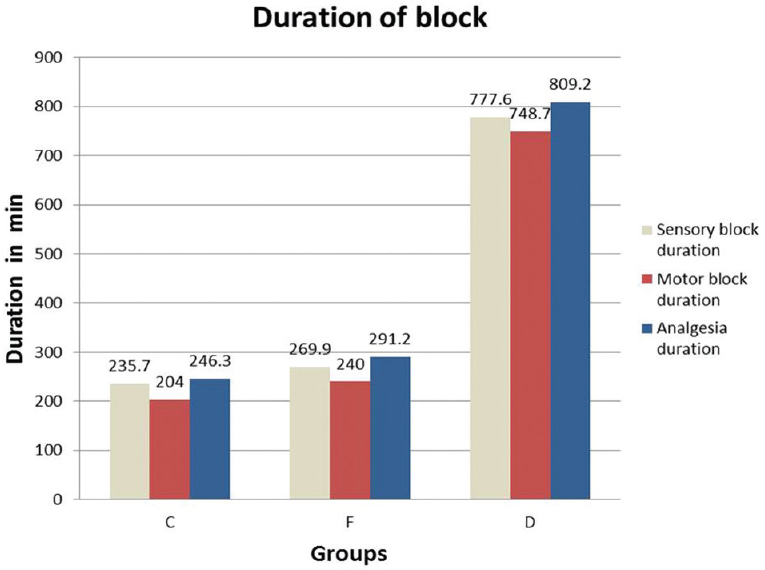 The onset of sensory and motor block was enhanced in group D than in groups C and F.
The duration of the sensory and motor block was significantly longer (P < 0.001) in group D (777.6 ± 117.2 and 748.7 ± 112.6 min, respectively) compared with group C (235.7 ± 37.9 and 204 ± 35.6 min, respectively) and group F (269.9 ± 39.6 and 240 ± 40.7 min, respectively). Analgesic duration was longer in group D versus groups C and F (809.2 ± 95.8, 246.3 ± 35.5, and 291.2 ± 34.6 min, respectively) [Table 2] and [Figure 1]. Figure 1: Sensory, motor, and analgesic durations in the three groups. 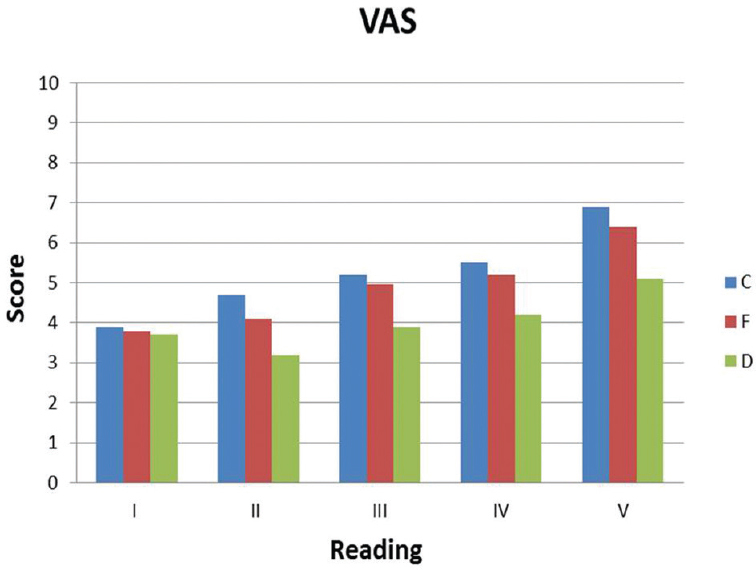 Postoperative VAS reading was lower in group D than in groups F and C (P < 0.05) from the second reading [Table 3] and [Figure 2]. Figure 2: Visual analog scale in the three groups. VAS, visual analog scale. 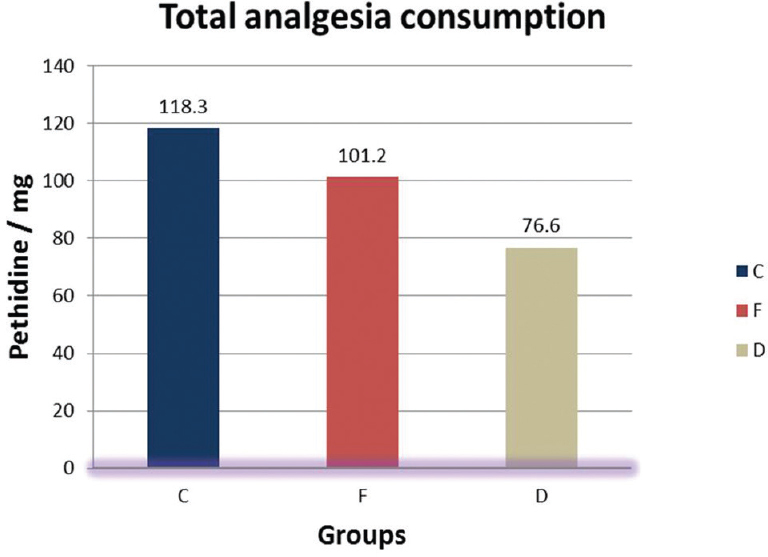 Total analgesic consumption (adolor and pethidine) was lower in group D (18 ± 18 and 76.6 ± 29 mg) than in group C (50 ± 26 and 118.3 ± 35.1 mg) and group F (47 ± 26 and 101.2 ± 23.6 mg), respectively [Table 4], [Figure 3] and [Figure 4]. 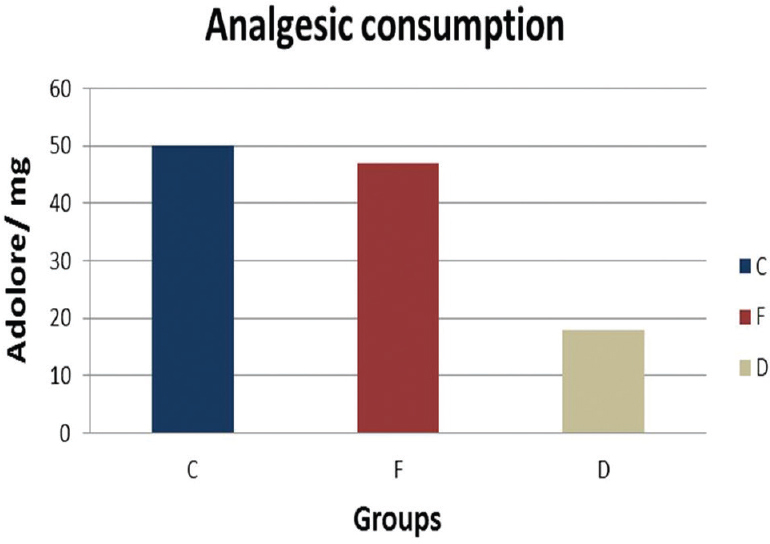 Figure 3: Total adolor analgesic consumption. Figure 4: Total pethidine analgesic consumption. 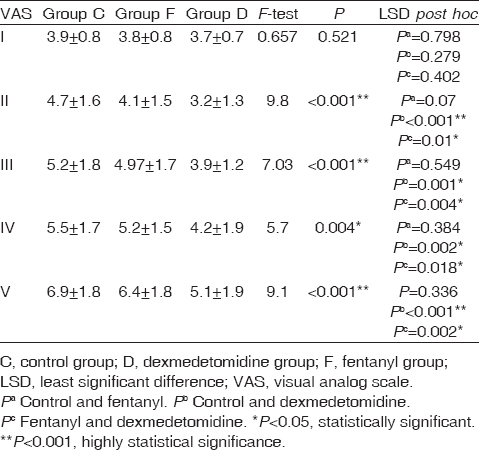 As dexmedetomidine has sedative effects and the patients received propofol infusion, RSS was higher in group D compared with groups C and F [Table 5]. Two patients developed hypotension in group D, which did not require any medication with bradycardia with significant difference than other groups but patients were stable and need no medication (heart rate did not decrease below 50 beat/min). There was no other complication in the three groups (dyspnea, drug overdose, or intravascular injection). The present study revealed that ICB with 25 ml 0.5% bupivacaine supplemented with 100 μg dexmedetomidine significantly affects block characteristics evident by the shortened onset time of both sensory and motor blocks compared with the same block supplemented by 100 μg fentanyl and 0.5% bupivacaine in patients undergoing upper limb surgery. Moreover, addition of dexmedetomidine significantly prolonged the time to complete sensory resolution and regression of motor block with prolonged analgesic effects of the ICB, evident by the decreased postoperative pain scores (VAS), total analgesic consumption, and prolongation of time to first request for analgesia. Some studies have reported that US guidance improves the quality of ICB and increases the success rate and density of the block . Additives increase the duration of local anesthetic action, which is often desirable because it prolongs surgical anesthesia and analgesia as fentanyl and dexmedetomidine ,. Lomate et al. added dexmedetomidine to xylocaine for the ICB, and they concluded that addition of dexmedetomidine enhances onset of the block, which was faster compared with the present study as they used xylocaine. They observed that addition of dexmedetomidine also prolonged sensory, motor, and analgesic duration. In addition, Ammar and Mahmoud  assessed the use of dexmedetomidine for pain control in upper limb surgery along with bupivacaine under US-guided ICB, and showed concomitant results to the present study. The dexmedetomidine group of patients (group II) showed a statistically significant shorter time to onset of sensory and motor blockade. Longer sensory and motor block durations lower verbal rating scale pain scores, prolong analgesia, and lower morphine rescue requirements for 48 h after surgery. All patients recovered without evidence of sensory or motor deficit. In contrast with our results, Mirkheshti et al. studied addition of dexmedetomidine or ketorolac for US-guided ICB in patients who were candidates for elective distal arm and forearm surgeries and found no significant differences in sensory block onset between three groups (dexmedetomidine, ketorolac, and lidocaine). However, motor block onset was statistically shorter in the dexmedetomidine group than in the other groups. Sensory block duration and motor block duration in the dexmedetomidine group were significantly longer compared with the ketorolac and placebo groups. Time to first analgesic request after the procedures was longer in the dexmedetomidine group compared with the placebo group. Dexmedetomidine showed the lowest mean arterial pressure, and heart rate in the dexmedetomidine group was significantly lower than that in ketorolac and placebo groups. El-Radaideh et al. assessed the efficacy of fentanyl as an adjunct to vertical ICB performed with lidocaine and bupivacaine. They evaluated the extent of sensory block at 5, 10, 15, and 30 min and motor block 30 min after injection of the anesthetic solution. Sensory block of the medial brachial cutaneous, medial antibrachial cutaneous, musculocutaneous, radial, median, and ulnar nerves was assessed by pinprick (27 G needle) and compared with the same stimulation on the contralateral arm. Their results are comparable with the present study with regard to radial nerve assessment as there was loss of sensation in the radial nerve in group F at 5, 10, 15, and 30 min, which was significantly faster compared with group C (P < 0.001), but no significant difference in the quality of sensory block was seen in any other peripheral nerve distribution. No statistically significant differences were observed in other studies which guided the motor block at 30-min point, which was in contrast with the results of the present study. Sarkar et al. evaluated the efficacy of fentanyl and buprenorphine in improving blockade characteristics when used as additives for supraclavicular block. The onset time of the sensory and motor blocks was delayed in the fentanyl group compared with the control group, and these results are in contrast with the present study, as addition of fentanyl enhanced the degree of sensory block compared with the control group. In contrast to the present study, Yaghoobi et al. , compared the use of fentanyl and dexamethasone as additives to lidocaine through axillary block in forearm fracture, and the difference in the mean onset time of sensory block and motor block between the groups was insignificant and the mean onset of sensory block in lidocaine (L) and lidocaine- fentanyl (LF). El-Sawya et al. assessed the grade of sensory and motor block in their study – US-guided supraclavicular brachial plexus nerve block versus ICB in chronic renal failure patients undergoing IV fistula creation. The found that the sensory grade at 10, 20, and 30 min for the median nerve was 1.4, 1.9, and 2, respectively; the musculocutaneous nerve and the radial nerve had higher grades of sensory block at the same time (1.7, 2, and 2 and 1.5, 1.8, and 2, respectively). The ulnar nerve was the last one to be blocked and its grades were 0.9, 1, and 1.5 at 10, 20, and 30 min, respectively. These results are in agreement with our results; this can be explained by their technique in achieving ICB with a single injection at the posterior cord only, which delays the onset of ulnar nerve blockage as in our study, and why they had a higher block grade in the radial nerve, which did not agree with our results, as in the present study we injected twice, one at the posterior cord and one at the lateral cord, and therefore the median and musculocutaneous nerve were the first nerves to achieve a higher block grade. We conclude that the addition of dexmedetomidine to a local anesthetic mixture for ICB hastens the onset and prolongs the duration of sensory and motor blocks, as well as the duration of postoperative analgesia. In addition, the use of US appears to permit accurate deposition of the local anesthetic perineurally, and has the potential to improve the success and decrease the complications of ICB. Ammar AS, Mahmoud KM. Ultrasound-guided single injection infraclavicular brachial plexus block using bupivacaine alone or combined with dexmedetomidine for pain control in upper limb surgery: a prospective randomized controlled trial. Saudi J Anaesth 2012; 6:109–114. Sandhu NS, Capan LM. Ultrasound-guided infraclavicular brachial plexus block. Br J Anaesth 2002; 89:254–259. Horlocker TT, Wedel DJ. Ultrasound-guided regional anesthesia: in search of the Holy Grail. Anesth Analg 2007; 104:1009–1011. Dingemans E, Williams SR, Arcand G, Chouinard P, Harris P, Ruel M, Girard F. Neurostimulation in ultrasound-guided infraclavicular block: a prospective randomized trial. Anesth Analg 2007; 104:1275–1280. Fredrickson MJ, Wolstencroft P, Kejriwal R, Yoon A, Boland MR, Chinchanwala S. Single versus triple injection ultrasound-guided infraclavicular block: confirmation of the effectiveness of the single injection technique. Anesth Analg 2010; 111:1325–1327. Mahmoud KM, Ammar AS. Ultrasound-guided continuous infraclavicular brachial plexus block using bupivacaine alone or combined with adenosine for pain control in upper limb surgery. Saudi J Anaesth 2011; 5:132–137. Duma A, Urbanek B, Sitzwohl C, Kreiger A, Zimpfer M, Kapral S. Clonidine as an adjuvant to local anesthetic axillary brachial plexus block: a randomized, controlled study. Br J Anaesth 2005; 94:112–116. Gormley WP, Murray JM, Fee JP, Bower S. Effect of the addition of alfentanil to lignocaine during axillary brachial plexus anaesthesia. Br J Anaesth 1996; 76:802–805. El-Radaideh KM, Yasser HJ. The efficacy of fentanyl as an adjunct to vertical infraclavicular brachial plexus block performed with lidocaine and bupivacaine. Jordan Med J 2008; 42:155–161. Sarkar D, Khurana G, Chaudhary A, Sharma JP. A comparative study on effects of adding fentanyl and buprenorphine to local anesthetics in brachial plexus block. J Clin Diagn Res 2010; 4:3337–3343. McCartney CJ, Lin L, Shastri U. Evidence basis for the use of ultrasound for upper-extremity blocks. Reg Anesth Pain Med 2010; 35:10–15. Lomate P, Patil D, Jadhav V, Deshpande T, Patil M. Usefullness of dexmedetomidine as an adjuvant to local anaesthetics in infraclavicular brachial plexus block for prolongation of postoperative analgesia. Int J Recent Trends Sci Technol 2015; 13:567–572. Mirkheshti A, Saadatniaki A, Salimi A, Rasi AM, Memary E, Yahyaei H. Effects of dexmedetomidine versus ketorolac as local anesthetic adjuvants on the onset and duration of infraclavicular brachial plexus block. Anesth Pain Med 2014; 4:e17620. Yaghoobi S, Seddighi M, Yazdi Z, Ghafouri R, Khezri MB. Comparison of postoperative analgesic effect of dexamethasone and fentanyl added to lidocaine through axillary block in forearm fracture. Pain Res Treat 2013; 2013:1–6. El-Sawya A, Mohameda NN, Mansoura MA, Salemb MR. Ultrasound-guided supraclavicular versus infraclavicular brachial plexus nerve block in chronic renal failure patients undergoing arteriovenous fistula creation. Egypt J Anaesth 2014; 30:161–171.